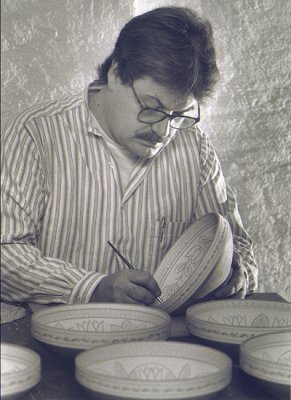 Master Potter Hans Törngren started Törngrens Krukmakeri in Falkenberg in 1789 and from that day pottery-making has continued in the same workshop and within the same family, passing from father to son. Bengt Törngren who currently runs the workshop is the 7th generation. During the latter part of the 18th century and all of the 19th a thriving pottery industry flourished in Falkenberg. It has been 21 different potterys in town. Today only Törngrens remains from those times. The productions in these workshops was mainly domistic ware such as storage jars, plates and bowls but "kakelugnar" (ceramic fireplaces) were also produced up until the early 1900`s when more modern forms of heating replaced them. The methods of decoration used in Falkenbergs pottery were sometimes simple "sliptrailing"used a goose-quill pen or an animal horn to trail a pattern of white liquid clay (slip) on to the red-brown clay of the pot and other times "sgraffito" or "painting" where the whole red earthenware item was dipped in white slip and decoration scratched into or painted onto the surface. On top of these patterns was applied a transparent glaze. The latter design methods were predominant in Falkenberg and can be traced from Holland via Germany, Denmark and upp to Tröndelag in Norway, helped no doubt, by the wanderings of newly qualified potters who travelled extensivly during the 18th and 19th century in order to gain experience. The traditional pattern was based on a flower, usually the tulip or flax, but each potter developed his own variations on this theme. This type of decor has therefore not been "invented" by any person but has developed out of over 200 years of tradition. Törngrens still work with this traditional production whitch also means that the hold to the simple, time-honoured shapes that suit the decoration so well. Törngrens Krukmakeri have still their own decorative patterns "TÖRNGRENS-MÖNSTRET" designed by Hans Törngren 1789 the man who started Törngrens Pottery. Traditionally, Törngrens also produce clay Cuckoo.whisles. These were originally made by the companies apprentices and sold to supplement their meagre income before they qualified as potters. A special drinking-vessel "GYCKELKRUS", (the Jesters Jug) came into production in the mid 1800´s. This is made in such a way that it requires a special technique to drink from it!